When you hear the word strategy, what comes to mind? For many managers, the word strategy means gigantic PowerPoint decks and overstuffed 3-ring binders collecting dust. Great strategy doesn’t come from an Excel spreadsheet or PowerPoint deck. Great strategy comes from great strategists. The word innovation is most commonly associated with a cool new technology that will change the world. There are more than a dozen types of innovation for you to tap into. Innovation is the creation of new value; strategy is configuring resources in a unique way to develop and deliver that value. Unfortunately, only 25 percent of managers believe their companies are good at both strategy and innovation. Too often, strategy and innovation are approached separately, even though they share the common foundation of insight. 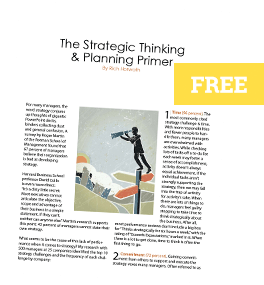 The skill required to generate insight is strategic thinking. By becoming an elite strategic thinker, a leader is better prepared to combine both strategy and innovation into competitive advantage. To elevate means to lift up, or to raise to a higher intellectual level. Today, you need to be able to quickly elevate your thinking from down in the tactical weeds of the business to a higher level. Elevation enables you to stop being reactive, avoid fire drills and expand your perspective to understand how the key pieces of the business fit together to provide superior value to customers. Coalesce: Fusing together insights to create an innovative business model. Compete: Creating a system of strategy to achieve competitive advantage. Champion: Leading others to think and act strategically to execute strategy. When your career comes to a close, how will you be remembered–as a truly strategic leader or a tactical firefighter? Contrary to popular belief, it’s not about the little things. It’s about how you set the strategic direction that shapes the trajectory of a team … a business … a company … a career. It’s about rising above the fray and seeing things others don’t. And you can make that happen, if you’re willing…to elevate.